Esports betting at 5Dimes is the latest addition from this ever so popular bookmaker. If you are a betting veteran, you must have heard about 5Dimes. Even though this bookmaker was mostly based around sports like soccer, basketball, and tennis, they decided to add Esports betting as well. Even though there are not any specific welcome bonuses provided on the site, I assure you that there are some applicable to Esports. Most of the bonuses are tied to free bets or cash backs though. There are also a lot of Casino bonuses which are quite better than the ones tied to sports and Esports. You are probably wondering what does Esports betting at 5Dimes has that other Esports betting bookmakers don’t? The answer is straightforward. Odds difference between this bookmaker and others cannot be compared. As we already mentioned above, it feels like 5Dimes has been around for ages. This bookmaker was established in late 1996. Ever since they started their business they were operating out of San Jose, Costa Rica. It is common knowledge that bookmakers who are established in Costa Rica are also regulated and licensed in Costa Rica. If you want to be the best in the Esports betting business, you need to have stable and reliable customer support. 5Dimes has exactly that. There are several ways of reaching out to their professional staff, but we will discuss those further in this article. Just like every other Esports betting bookmaker out there, 5Dimes offers a lot of different Esports titles to bet on. All of the best titles are covered which include CS:GO, Dota 2, League of Legends, Rainbow Six Siege, etc. 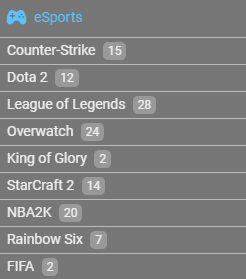 If we are to look into the popularity of Esports markets, we can clearly see that CS:GO is leading the charge on 5Dimes. After CS:GO comes League of Legends and Overwatch. In the end comes Dota 2 and Rainbow Six Siege. From my perspective, it is kinda odd that Dota 2 is not topping the charts. Esports betting at 5Dimes is provided with a full package. They got every aspect of Esports betting covered. The most popular Esports bets are pre-match placed bets. After pre-match betting comes live betting which is also covered by 5Dimes. Lastly, outright betting or so-called “futures” betting is also available but not for every tournament this Esports betting bookmaker covers. We already said that 5Dimes is providing its players with live betting. There is nothing better than sitting back, relaxing and watching CS:GO or League of Legends tournaments being played live. There is only one thing that is better, live betting. However, Esports betting at 5Dimes is not everything this bookmaker offers you guys with. They probably have one of the largest sportsbook markets in the entire world. They literally have everything covered. If you are looking for something in specific, I assure you that you will find it on 5Dimes. Alongside Esports betting, you can also bet on sports such as soccer, football, tennis, ice hockey, basketball, golf, darts, etc. To be completely honest with you, it took us a while to find Esports markets on 5Dimes. In order to view any markets, you will have to sign-up for an account with this Esports betting bookmaker. However, once you have done that, you will have no problem managing around the site, mainly because the site looks a bit old-fashioned. If you are looking for high pre-match betting odds, then you have come to the right place. Esports betting at 5Dimes is based on providing their customers with the highest odds on the market. Even though this is not the case in some situations, from what we were able to find out, those situations are very rare. Let’s start with pre-match betting. This is the essential part of every Esports betting bookmaker. 5Dimes realized that early on, hence why they decided to stay one step ahead of their rivals. At the moment, no one came close to matching their pre-match betting odds and I do not think this is going to change anytime soon. 5Dimes is also offering solid odds for Esports live betting. Even though these odds are not topping the charts, they are still great and well in the range of their competition. Given the fact that pre-match betting odds are through the roof, you will simply have to be satisfied with average odds for Esports live betting. Lastly, outright betting on certain Esports tournaments has always been provided with huge odds. This is exactly the same as with 5Dimes. Sadly, there are not a lot of outright bets at the moment, but hopefully, 5Dimes will add more in the near future. Welcome bonuses are not really something you want to skip. This is why 5Dimes decided to let you create your best welcome bonus. This can be either a deposit bonus, cash back or promotion called “Reduced Juice”. Choose from many "Reduced Juice" options like on NFL, NCAA football, Canadian Football, NBA, NCAA basketball, WNBA, MLB, NHL, grand slam tennis, PGA golf, boxing, MMA, and special events. Reduced juice options are generally posted on the day of the event. Deposit bonuses are tied to a 50% deposit bonus up to $520. You can also acquire these through free play rewards. Secondly, you can get 20% cash back. There are also several more welcome bonuses, but they are mostly related to Casino. There are a lot of ways to deposit on 5Dimes. Given the fact that this Esports betting bookmaker was established in 1996, you can expect to see some old-fashioned deposit and withdrawal methods. A lot of withdrawal methods is charged with a certain fee, which is not really good. On the other hand, there are also deposit methods which do not have any additional fees while withdrawing. At the moment, the most popular deposit methods are credit cards, VISA and MasterCard. Alongside those, Bank Wire deposits are very popular with this bookmaker. The latest addition to the 5Dimes banking options is cryptocurrency. At the moment, they are accepting deposits and withdrawals made by BitCoin. There are not a lot of rules you will have to follow with 5Dimes. Here are a couple of standard ones. A minimum bet of $0.5 has been put in place. On the other hand, you will be able to bet a maximum of $5,000 on a single bet. However, if you decide to place bets via live betting, keep in mind that you will only be able to bet a maximum of $500. When it comes to depositing, a minimum of $50 has been put in place. We briefly talked about 5Dimes’ customer support above. This time around, we will go into detail about the ways of getting help for your Esports bets. There are three different ways of reaching out. The first one is live chat, followed by e-mail. Lastly, two phone numbers have also been put in place. Let’s start with live chat. Just like every other Esports betting bookmaker, 5Dimes is providing their customers with 24/7, 7 days a week support. From what we were able to find out, staff that helped us was very professional and they answered our questions within a couple of minutes. However, it took us a couple of minutes to be connected to an agent, but it is worth it if you ask me. Lastly, phone numbers have been added based around two types of customers. 1-877-332-7501 is completely dedicated to new players. So if you recently joined and you have some questions about the website itself, make sure to ring 5Dimes support stuff on the number we mentioned above. The second phone number is simple customer service. 1-800-430-5896 will connect you directly to the professional staff where you can find answers for your problems.